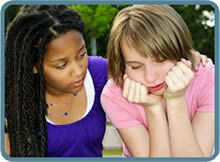 Home » Your Questions: Teens » Why won’t anyone listen to me when I tell them I’m sick? If you cannot keep down water or food of any kind or amount throughout the course of one or more 24-hr. days, it is not time to talk about crackers on your bedside table. It is time to see your doctor. Make an appointment. Explain that you cannot afford to wait to see him/her. Then prepare for the visit before you go. Here’s what to do. Describe in detail the symptoms you’re having. Write down when you first noticed each of these symptoms. Explain when your symptoms occur, and how long they last. List the things that seem to “trigger” your symptoms. Explain how you’ve already tried to make yourself feel better – even if none of those things worked. Write down all medications you’re taking, even if it’s something you bought “over-the-counter” at the drugstore, grocery store, or mini-mart. Don’t forget to put down the names of vitamins, herbal products, and any other kinds of supplements you’re taking. Write down whether you smoke, have drunk alcohol, or used drugs. Describe any allergies you have to medications, foods, or anything else. If you’re under the treatment of any other doctors or therapists, write down whom you’re seeing and why. Why should you do all of this writing? You should write everything down so you don’t forget to tell your doctor every detail he/she needs to know. You may be feeling sick at your appointment time. If you are, do you think you’ll be able to think clearly and remember everything you wanted to tell and ask him/her? Probably not. Writing everything down will insure that you don’t leave anything out, and it will send a message to your doctor that you are serious about this — that this visit is vitally important to you. Don’t leave without getting your questions answered and your concerns addressed. Don’t feel guilty for taking up his time. Help you to remember what was discussed. Give that person permission to ask questions as well, if you’re comfortable with that. Every single day, OB/GYN doctors hear that their newly-pregnant patients feel sick. Your doctor needs to know that your case is severe, and that you need medical intervention right now. Your doctor does not want you to be living day after day without being able to drink any liquids or eat food of any kind. That is not normal in a pregnancy. It can lead to serious complications. Doctors are able to help women who are suffering during their pregnancies the way you are. Insist on treatment.If your doctor dismisses your concerns, you need to see a different doctor. If you are unable to get a referral for another doctor from trusted people you know, look under the heading “Abortion Alternatives” in the Yellow Pages in your area to find a Pregnancy Help Center to call. They have referrals to doctors who will believe you, take your condition seriously, and help you.